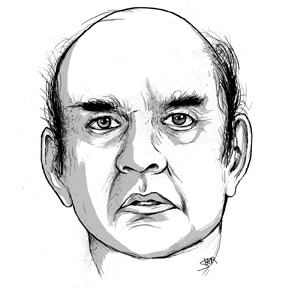 I recently was asked to contribute an illustration of Harvey Pekar to Smith Magazine. They asked a group of 70 artists draw his portrait, as a surprise for his 70th birthday. Please check out the rest of the pieces in the project over at SmithMag. There are lots of other amazing renditions of Mr. Pekar for you to feast your eyes on, and I’m quite sure you’ll be glad you did. Your Harvey Head is awesome! Wow. Nice. Congratulations on being asked to contribute. Great portrait of Mr. Pekar. Honestly.